For a while it seemed like we were being paid off by the people at Nabisco. 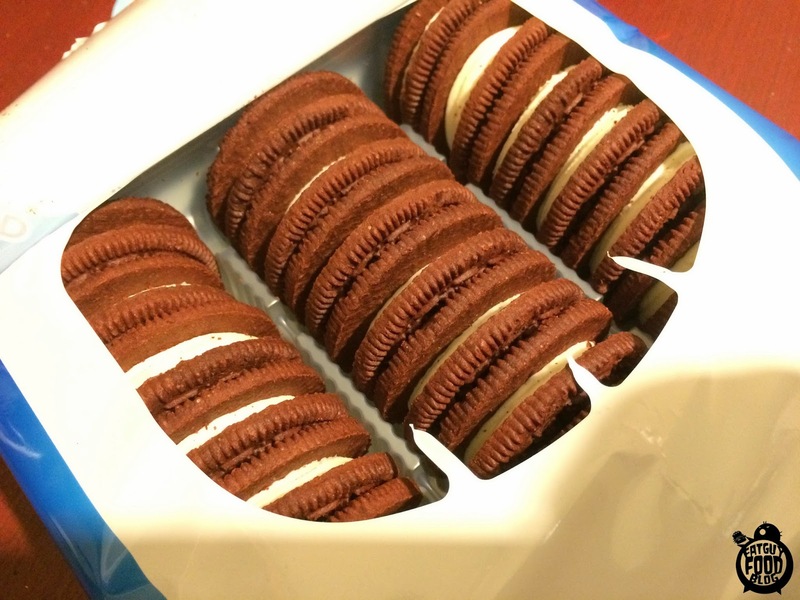 Nearly every other review on our site was for a new flavor of Oreo. Now, some of our readers like to joke about it and call us FATGUYOREOBLOG. Which...to be honest, wouldn't be a bad idea for a blog. I would read it. You probably would too right? Well since 2015 kicked off it's like the good folks at Nabisco have been in hiding, just waiting to debut the first of what will probably be 76 new flavors of Oreo this year. Well, it looks like that time has gone. 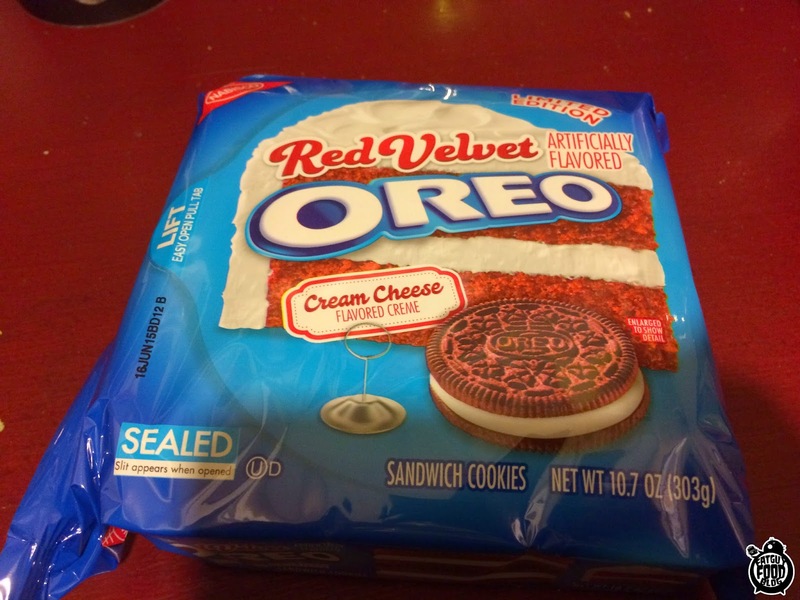 Ladies & Gents, we tracked down the Limited Edition Red Velvet Oreo cookies! Hmm...what's up with that cookie? Did the package print wrong? Now the first thing I'm going to tell you is that your eyes do not deceive you. This package is SMALL. It looks to be maybe 2/3 the size of a usual pack. I was torn about this. The reasonable part of my brain said, "Hmm. That's a good idea, in case this limited edition Oreo isn't that good." But the other part, the fat guy in my brain says, "SERIOUSLY?! A MINI-PACKAGE?! What the hell is going on? What scam are you trying to pull on us, Oreo?!" But in the end I will just say that I hope this isn't something they plan on doing a lot in the future because Oreo has a great track record. For some reason it makes me think that they put them out in small packages because they didn't think people would be interested enough to buy a full package of them. I'm sure that's not the case, but as a consumer it looks to me like they are counting these bad larrys out before I even take my first bite! NOPE! THEY ARE RED COOKIES! First thing you notice? YUP, those cookies are red. Already I have forgiven them for the small packages because I am so excited to see another color of Oreo cookie besides Golden and the Original black ones, which people call chocolate, but don't taste like any chocolate I've ever had in my life. 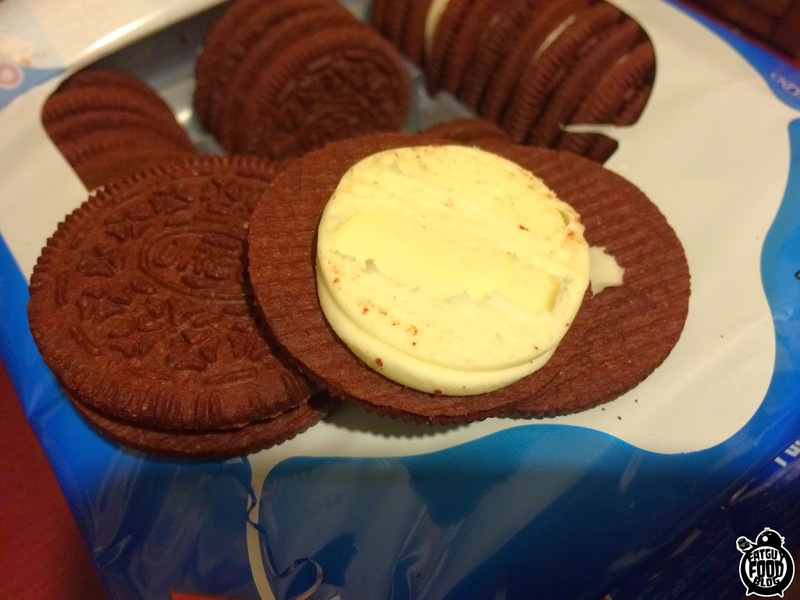 Red Velvet Oreos NEEDED to be red. Bravo, Nabisco for going the extra mile! But how did they taste? Quite good! While the red cookie pretty much tastes just like the original Oreos, the frosting is what really sets it apart. The package boasted cream cheese flavored creme, and that's definitely what you get! It's a strange hybrid of the usual Oreo creme infused with the taste of cream cheese and I would say they definitely nailed the taste. Should you give these a try? Absolutely. If you're an Oreo fan and like to try all the crazy flavors they come up with, you should absolutely track these down. Don't let the little package discourage you, either. If you think you'll really like them, just scoop up two! I'm going to give the Limited Edition Red Velvet Oreo cookies a solid B+. They nail the red velvet cake flavor really well, especially where the cream cheese creme comes into play. But the crazy fat guy in my brain won't allow a better grade than that because of the small package. WHY DO THEY WANT US TO EAT LESS COOKIES?!?! As always, feel free to drop us a line and tell us how great we are! Or if you have any ideas for future reviews, we like that too! Some item you saw at the grocery store? Perhaps the new offering from your favorite fast food joint? Ask us if we'll give it a review! You can drop us an email at fatguyfoodblog@gmail.com ! Be sure to follow us on Twitter for mini-reviews from the road , or even Like our Facebook page so you'll know every time we post a new review and you won't miss the cool snack world news we drop on there all the time!